Spray 5-quart slow cooker with cooking spray. Heat 12-inch nonstick skillet over high heat. Season brisket with salt and pepper on both sides. Add 2 teaspoons oil to skillet. Cook brisket in oil about 3 minutes on each side or until brown. Carefully transfer brisket to slow cooker, and add garlic. Meanwhile, in blender, place chipotle salsa ingredients. Cover; blend on medium speed until smooth. Pour half of salsa into slow cooker (about 1 cup). Cover and refrigerate remaining salsa. Cover slow cooker; cook on High heat setting 4 to 4 1/2 hours or until brisket is very tender. Meanwhile, in same skillet, add 1 teaspoon oil; heat over high heat. Stir in onion slices. Reduce heat medium-low, and continue cooking and stirring until onions are caramelized, about 15 minutes. Remove from skillet; cover and refrigerate until serving time. Remove brisket from slow cooker, and shred with fork. Reheat caramelized onions. 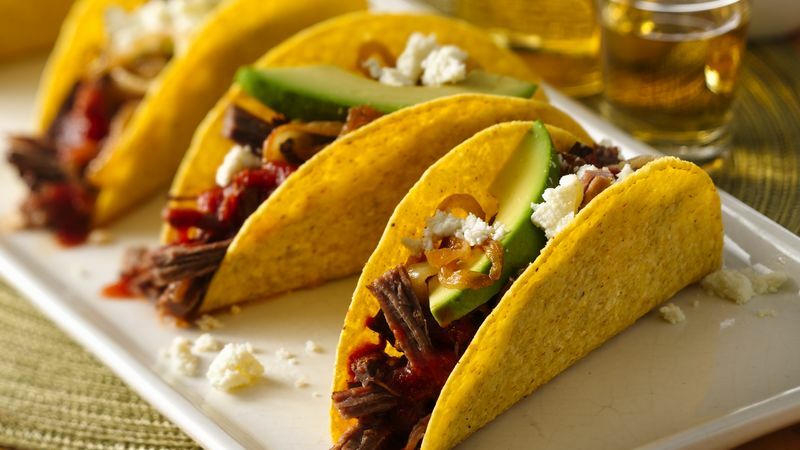 Spoon brisket into each taco shell, and top with caramelized onions. Spoon 1 tablespoon reserved salsa over each; top with queso fresco and avocado. To make a MANgarita: Pour a shot of aged tequila. Open a bottle of Mexican beer. Serve with a lime wedge and a pile of coarse salt.